Like many drinkers out there, most of our SoCo memories involve questionable college decisions (hearing the words "SoCo and lime shot" can still induce shivers). And given that reputation, most people don't know that SoCo actually has a long and storied history. New Orleans bartender Martin Wilkes Heron produced the first batch in 1874, and 30 years later, it was a smash at the 1904 World's Fair. From there, its popularity grew. 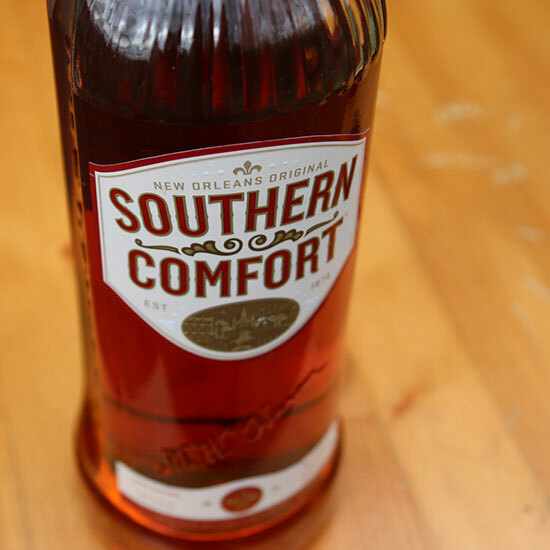 Despite its bronze color and origins in the American South, Southern Comfort isn't technically a whiskey—it is a neutral-spirit liqueur made with fruit and whiskey flavors. But it still shares quite a few characteristics with bourbon—sweet and spicy notes, pairs well with fruit flavors—and, once you properly balance its sweetness, it holds up well in quite a few cocktails. Give these three a try and see if you can't start seeing SoCo as something more sophisticated. We like just about any fruit liqueur with bubbles, and while SoCo is dramatically different from most fruit liqueurs out there, this drink is still a big success. A little bit of honey and a dash of Angostura bitters bring out its various sweet-spicy flavors, and a big lime twist brightens the whole thing up. Instructions: In a Champagne flute or other tall glass, combine 1 1/2 ounce SoCo with 1/4 ounce honey syrup (equal part honey dissolved in hot water). Add a dash of Angostura bitters. Top with 3 ounces of sparkling wine and garnish with a lime twist, twisting it over the top of the drink to spray its citrus oils all over. Classic Manhattan: whiskey and sweet vermouth. But SoCo is plenty sweet on its own, so SoCo and dry vermouth is our formula here, with all-important Angostura bitters to balance it out. As with any simple cocktail, the bitters and the citrus garnish are essential. Instructions: In a mixing glass with ice, combine 2 ounces SoCo and 1 ounce dry vermouth. Add a dash of Angostura. Stir until well-chilled. Strain into a cocktail glass without ice. Garnish with a big twist of lemon peel, twisting over the surface of the drink to spray its citrus oils all over. Inspired by those SoCo lime shots—but a lot better—this variation on a daiquiri uses fresh lime juice for a much more dynamic, lively cocktail. These go down easy but not, you know, frat-party easy. Instructions: In a cocktail shaker with ice, combine 2 ounces SoCo, 1 ounce freshly squeezed lime juice and 1/2 ounce simple syrup. Shake that all up and strain into a rocks glass with fresh ice. Garnish with a lime wheel.